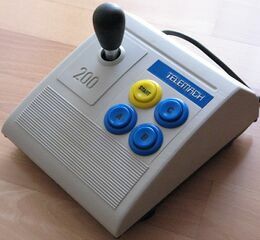 The Joystick 200 by Telemach is a third-party controller for the Sega Mega Drive. Telemach released multiple Joystick 200s across Europe. The most common, and likely first in the series, is an orange-finished two joystick for home computers - this is the model featured on the Mega Drive versions' box, despite the contents being that of a four button stick with a blue/yellow finish. Similar variants for the Nintendo Entertainment System and IBM PC also exist.